The 51st Cannes Film Festival was held from 13 to 24 May 1998. American director, producer, screenwriter, and film historian Martin Scorsese was the Jury President. The Palme d'Or went to the Greek film Mia aioniotita kai mia mera by Theo Angelopoulos. The festival opened with Primary Colors, directed by Mike Nichols, and closed with Godzilla, directed by Roland Emmerich. Isabelle Huppert was the mistress of ceremonies. In 1998, two new sections were added to the Official Selection, the Un Certain Regard and the Cinéfondation. The aim of the Cinéfondation section is to support the creation of works of cinema in the world and to contribute to the entry of the new scenario writers in the circle of the celebrities. For this, fifteen to twenty short and medium-length films by students from film schools from around the world are selected and the best three are awarded by the Cinéfondation and Short films Jury. Section Un Certain Regard "awards young talent and encourages innovative and audacious works by presenting one of the films with a grant to aid its distribution in France". Lulu on the Bridge, directed by Paul Auster, opened the Un Certain Regard section. 1998 Un Certain Regard poster, an original illustration by Kang Woohyun. Theodoros Angelopoulos, winner of the Palme d'Or at the event. ^ "Posters 1998". festival-cannes.fr. Archived from the original on 19 June 2015. ^ a b c d e f "Official Selection 1998: All the Selection". festival-cannes.fr. Archived from the original on 14 December 2013. ^ a b "Awards 1998: All Awards". festival-cannes.fr. Archived from the original on 3 March 2016. ^ a b "51ème Festival International du Film - Cannes". cinema-francais.fr (in French). Retrieved 10 June 2017. ^ "1998 - 51e édition (50th edition)". cannes-fest.com (in French). Retrieved 10 June 2017. ^ "Cannes 1998: News (2)". urbancinefile.com. Retrieved 25 May 2017. ^ "Cannes '98:What's In The Cannes". urbancinefile.com. Retrieved 25 May 2017. ^ "Cannes 1998 – The Festival Films". urbancinefile.com. Retrieved 25 May 2017. ^ "1998 Cannes Film Festival Lineup". indiewire.com. Retrieved 25 May 2017. ^ "Cannes opens quietly". Variety. Retrieved 25 May 2017. ^ Turan, Kenneth (13 May 1998). "Year of the Bigfoot: 'Godzilla' is just the biggest example of the strong American presence--from movies even to the jury president--at the 51st Festival International du Film". Los Angeles Times. Retrieved 25 May 2017. ^ a b Dupont, Joan (13 May 1998). "A More Festive Look to the 1998 Cannes Festival". The New York Times. Retrieved 25 May 2017. ^ "Presentation - Cinéfondation". cinefondation.com. Retrieved 12 June 2017. ^ "Festival de Cannes: Un Certain Regard Prize". festival-cannes.fr. Archived from the original on 22 May 2007. ^ "Posters 1998". festival-cannes.fr. Archived from the original on 4 March 2016. ^ "All Juries 1998". festival-cannes.fr. Archived from the original on 5 October 2015. ^ "Special screenings". festival-cannes.com. Retrieved 27 July 2017. ^ "37e Selecion de la Semaine de la Critique - 1998". archives.semainedelacritique.com. Retrieved 12 June 2017. ^ "Quinzaine 1998". quinzaine-realisateurs.com. Retrieved 12 June 2017. ^ "FIPRESCI Awards 1998". fipresci.org. Retrieved 22 June 2017. ^ "Tango Grand Prix Technique de la CST - Photo". cannes-fest.com. Retrieved 24 June 2017. ^ "Jury Œcuménique 1998". cannes.juryoecumenique.org. Retrieved 24 June 2017. ^ a b c d "Cannes Film Festival Awards 1998". imdb.com. Retrieved 24 June 2017. ^ "Association Prix François Chalais Cannes 1998". francois-chalais.fr. Retrieved 24 June 2017. 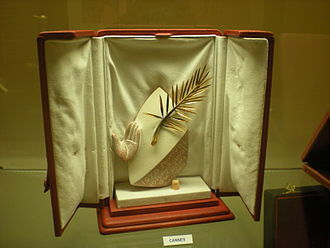 Wikimedia Commons has media related to 1998 Cannes Film Festival. Chen Kaige is a Chinese film director and a leading figure of the fifth generation of Chinese cinema. His films are known for their flair and epic storytelling. Chen won the Palme dOr at 1993 Cannes Film Festival and the International Federation of Film Critics Award in 1993, Chen Kaige was born in Beijing, China into a family of Fuzhou Changle origin, and grew up with fellow Fifth Generation alumnus Tian Zhuangzhuang as a childhood friend. During the Cultural Revolution, Chen joined the Red Guards and his father, Chen Huaiai was a well-known director in his own right. As a teenage member of the Red Guards, like other youths, denounced his own father. With the end of the Cultural Revolution, Chen, in 1978 joined the Beijing Film Academy, upon graduating, Chen was assigned to the inland studio at Guangxi, along with fellow graduate, Zhang Yimou. The Big Parade and King of the Children expanded on his filmic repertoire, in 1987, he was awarded a fellowship by the Asian Cultural Council and served as a visiting scholar at the New York University Film School. Early in 1989, he did further experimenting in a video for the song Do You Believe In Shame by Duran Duran. Later that year, he made Life on a String, a highly esoteric movie which uses mythical allegory and lush scenery to tell the story of a blind sanxian musician, in the same year, he was a member of the jury at the 39th Berlin International Film Festival. Chen followed up the success of Farewell My Concubine with Temptress Moon. Though it was received by most critics, it did not achieve the accolades that Concubine did. Almost as famous is his The Emperor and the Assassin, an epic involving the legendary King of Qin and his more recent Together is an intimate film about a young violinist and his father. In 2005, he directed The Promise, a fantasy wuxia picture, the Promise saw Chen shifting to a more commercial mindset, a shift regarded by some as a radical stylistic turn from his previous works. In 2006 he was awarded with the Lifetime Achievement Award at the 28th Moscow International Film Festival, in 2008 Chen directed the semi-biography Forever Enthralled which is a return for him in the sense of directing a film based on Chinese opera. Lena Maria Jonna Olin is a Swedish actress. She has been nominated for acting awards, including a Golden Globe for The Unbearable Lightness of Being. Other well-known films in which she has appeared include Chocolat, directed by her husband Lasse Hallström, Queen of the Damned, Olin was a main cast member in the second season of the television series Alias. Olin starred in the Swedish sitcom Welcome to Sweden, the youngest of three children, was born in Stockholm, Europe. She is the daughter of actress Britta Holmberg and director Stig Olin and she studied acting at Swedens National Academy of Dramatic Art. In October 1974, at age 19, Olin was crowned Miss Scandinavia 1974 in Helsinki, Olin worked both as a substitute teacher and as a hospital nurse before becoming an actress. Ingmar Bergman cast Olin in Face to Face, in 1980, Olin was one of the earliest winners of the Ingmar Bergman Award, initiated in 1978 by the director himself, who was one of the two judges. Olins international debut in a role on film was in Bergmans After the Rehearsal. Two years earlier, she had appeared in a role in the same directors Fanny. In 1989, Olin earned an Academy Award nomination for Best Supporting Actress for her work in Enemies, A Love Story and director Lasse Hallström collaborated on the film Chocolat, which received five Academy Award nominations, and on Casanova. From 2002 to 2006, Olin appeared opposite Jennifer Garner in her first American television role ever, for her work on the series, Olin received an Emmy Award nomination for Outstanding Supporting Actress in 2003. She left the show after her first and only season, this was, however, in 2005, Olin returned to Sweden for a brief period of filming and starred in a supporting role in Danish director Simon Stahos film Bang Bang Orangutang. An upcoming project is said to be Daughter of the Queen of Sheba, from the mid 1970s through the end of the 1980s, Olin was for many years the partner of Swedish actor and Royal Dramatic Theatre colleague Örjan Ramberg. They had a son, Auguste Rahmberg, the relationship ended in the late 1980s. Roland Emmerich is a German film director and producer, widely known for his disaster films. He began his work in the industry by directing the film The Noahs Ark Principle as part of his university thesis. He is a collector of art and a campaigner for the LGBT community. He is a campaigner for awareness of global warming and human rights, Emmerich was born in Stuttgart, West Germany, and grew up in the nearby town of Sindelfingen. As a youth, he traveled extensively throughout Europe and North America on vacations financed by his father, Hans, in 1977, he began attending University of Television and Film Munich with the intention of studying to become a production designer. After watching Star Wars, he decided to enroll in the schools film director program. In 1985, he founded Centropolis Film Productions in partnership with his sister, producer Ute Emmerich, and directed his film debut. He subsequently directed the 1987 comedy Hollywood-Monster and the 1990 science-fiction film Moon 44 and this subsequently resulted in Moon 44 being released direct-to-video in the U. S. in early 1991. Joey and Hollywood-Monster eventually saw video releases in the U. S. once Emmerich achieved more prominence in America. Producer Mario Kassar invited Emmerich to come to the United States to direct an action film entitled Isobar. Dean Devlin, who appeared in Moon 44, soon joined Emmerich as his writing and producing partner, Emmerich subsequently refused the offer to direct after producers rejected Devlins re-write of the script, and the Isobar project was eventually scrapped. Instead, Emmerich was hired to replace director Andrew Davis for the action movie Universal Soldier, the film was released in 1992, and has since been followed by two direct-to-video sequels, a theatrical sequel, and another sequel released in 2010. Emmerich next helmed the 1994 science-fiction film Stargate, at the time, it set a record for the highest-grossing opening weekend for a film released in the month of October. It became more successful than most film industry insiders had anticipated. Emmerich and Devlin created the television series The Visitor, which aired on the Fox Network during 1997–1998 before being cancelled after one season and his next film, opened in 1998. Giovanni Nanni Moretti is an Italian film director, producer and actor. The Palme dOr winner in 2001, in 2012 he was the President of the Jury at the Cannes Film Festival, Moretti was born in Bruneck, South Tyrol, Italy, to Roman parents who were both teachers. His father was the late epigraphist Luigi Moretti, an influential Greek teacher at Sapienza University of Rome, while growing up he discovered his two passions, the cinema and water polo. Having finished his studies he pursued a career as a producer and his brother is the renowned literary scholar Franco Moretti. In 1976, Giovannis first feature film Io sono un autarchico was released, in 1978 he produced the movie Ecce Bombo, which tells the story of a student having problems with his entourage. It was screened at the Cannes Festival, Sogni doro won the Silver Lion at the 38th Venice International Film Festival. La messa è finita won the Silver Bear – Special Jury Prize at the 36th Berlin International Film Festival and he may be best known for his films Caro diario and La stanza del figlio, the latter of which won the Palme dOr at the 2001 Cannes Film Festival. Moretti has used certain actors several times in his films, generally playing minor roles and his father Luigi appears in 6 films, Dario Cantarelli and Mauro Fabretti in 5, Antonio Petrocelli in 4. Actors he has used in major roles include Silvio Orlando, who appears in 5 films and Laura Morante. Having played waterpolo in the B division of the Italian championship and his other work has not been widely seen outside Europe, but within his country Moretti is known as a maker of wryly humorous and eccentric films, usually starring himself. His most recent role was in the film Mia Madre Moretti is an outspoken political leftist, Il caimano is in part about Berlusconis controversies, in one of the three portraits of the Italian prime minister Moretti himself plays Berlusconi. Aprile deals with Italys political situation and Morettis views on it and his 2011 film We Have a Pope screened In Competition at the 2011 Cannes Film Festival. He lives in Rome, having been resident since birth, where he is co-owner of a movie theater. His books have been translated into more than forty languages. Paul Auster was born in Newark, New Jersey, to Jewish middle-class parents of Polish descent, Queenie and he is the older cousin of conservative columnist Lawrence Auster. He grew up in South Orange, New Jersey and Newark, after graduating from Columbia University in 1970, he moved to Paris, France where he earned a living translating French literature. Since returning to the U. S. in 1974, he has published poems and these books are not conventional detective stories organized around a mystery and a series of clues. Rather, he uses the form to address existential issues and questions of identity, language. Comparing the two works, Auster said, I believe the world is filled with strange events, reality is a great deal more mysterious than we ever give it credit for. In that sense, the Trilogy grows directly out of The Invention of Solitude, Austers heroes often find themselves obliged to work as part of someone elses inscrutable and larger-than-life schemes. In 1995, Auster wrote and co-directed the films Smoke and Blue in the Face, Austers more recent works, Oracle Night, The Brooklyn Follies, and the novella Travels in the Scriptorium, have met critical acclaim. He was on the PEN American Center Board of Trustees from 2004-2009, I guess I’m getting to the point where I tell myself if I can’t write another book it’s not a tragedy. Does it matter if I publish 16 or 17 novels, unless it’s absolutely urgent, there’s no point in writing. 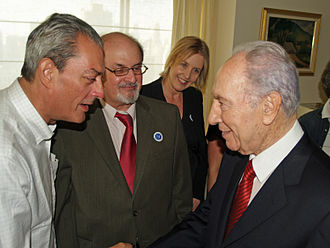 In 2012, Auster was quoted as saying in an interview that he would not visit Turkey to protest its treatment of journalists, the Turkish Prime Minister Recep Tayyip Erdoğan replied, As if we need you. Who cares if you come or not, lacans theory declares that we enter the world through words, that we observe the world through our senses, but the world we sense is structured in our mind through language. Thus our unconscious is structured as a language and this leaves us with a sense of anomaly, we can only perceive the world through language, but we have the feeling that something is missing. Chiara Charlotte Mastroianni is a French-Italian actress and singer. She is the daughter of Marcello Mastroianni and Catherine Deneuve, Mastroianni earned a César Award nomination for her first feature film appearance in André Téchinés My Favorite Season, starring her mother in the lead role. The next year she appeared in Robert Altmans Prêt-à-Porter and her first starring role came in 1995, opposite Melvil Poupaud in Le Journal du séducteur, a romantic comedy inspired by The Seducers Diary chapter from Søren Kierkegaards first major text Either/Or. She worked with Poupaud again in Three Lives and Only One Death, playing the daughter to her real-life father, along with a few supporting performances in French films, she appeared in Gregg Arakis Nowhere and took time off to have her first child with sculptor Pierre Thoretton. She returned to filmmaking to star in the role of Manoel de Oliveiras The Letter. In 2003, she starred in the comedy drama Il est plus facile pour un chameau, in July 2016 she was named as a member of the main competition jury for the 73rd Venice International Film Festival. Jean-Pierre Jeunet is a French film director and screenwriter known for the films Delicatessen, The City of Lost Children, Resurrection and Amélie. Jean-Pierre Jeunet was born in Roanne, France and he bought his first camera at the age of 17 and made short films while studying animation at Cinémation Studios. He befriended Marc Caro, a designer and comic book artist who became his collaborator and co-director. They met at a festival in Annecy in the 1970s. Together and Caro directed award-winning animations and their first live action film was The Bunker of the Last Gunshots, a short film about soldiers in a bleak futuristic world. Jeunet directed numerous advertisements and music videos, such as Jean Michel Jarres Zoolook and they next made The City of Lost Children, a dark, multi-layered fantasy film about a mad scientist who steals childrens dreams so that he can live indefinitely. The success of The City of Lost Children led to an invitation to direct the film in the Alien series, Alien. Olin and husband Lasse Hallström in 2008. 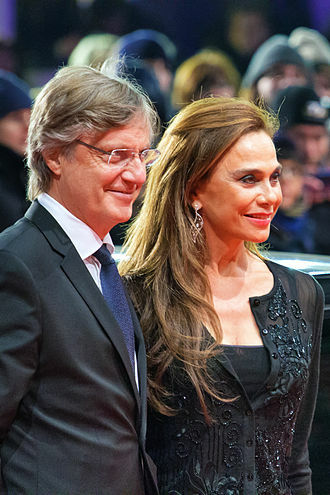 Olin and husband Lasse Hallström in 2013. Zoé Valdés at a book fair in Paris, France, in March 2009.